MPs are "far from confident" that HM Revenue and Customs can deal with the tax avoidance allegations made in the wake of the Paradise Paper leaks. The public accounts committee said the department would also struggle to deal with the pressure of Brexit and its own internal changes. HMRC believes Brexit alone could add 15% to its workload, the report said. The department says it has secured billions tackling tax avoidance and is focused on making Brexit a success. HMRC is undertaking 15 major transformation projects, according to the MPs' report, involving the closure of offices around the country, relocating staff to 13 regional centres and and making tax returns digital. The public accounts committee said that was now "not deliverable" as originally envisaged because of pressure on the department. This could increase further if HMRC gets hold of the so-called Paradise Papers - leaked financial documents which revealed how the powerful and ultra-wealthy invest cash in offshore tax havens - the committee said. The MPs' report quoted the department itself saying it was "not credible" to continue with its transformation programme as it is. It said HMRC had to "be clear about what it will do differently... and what the impact will be on customer service". Committee chairwoman Meg Hillier said the overhaul of HMRC "would have been less risky had it not attempted to do everything at the same time". "What was already a precarious high-wire act is now being battered by the winds of Brexit, with potentially catastrophic consequences," she said. "Action arising from allegations in the so-called Paradise Papers could also significantly increase the authority's workload. "HMRC accepts something has to give and it now faces difficult decisions on how best to use its limited resources - decisions that must give full consideration to the needs of all taxpayers." She said while its customer service had improved there were still questions over its "call-answering times". "Any new deterioration would be wholly unacceptable." A spokesman for HMRC said they were "fully focused on making the UK's exit from the EU a success" and was on track to be able to deal with "a significant increase in customs declarations at the border" by January 2019. "Following the Paradise Papers data leak, HMRC continues to look very closely at the information disclosed in the public domain, to see if it reveals anything new that could add to existing leads and investigations". "Since 2010, HMRC has secured an extra £160bn by tackling tax avoidance, evasion and non-compliance, including £2.8bn from customers who tried to hide money abroad to avoid paying what they owe. 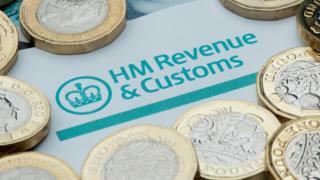 "The autumn Budget also introduced new measures to further bear down on offshore evasion and avoidance. These include a requirement notification of offshore structures, and extending the number of years of back tax that HMRC can assess."